Profile Response: Randy Gorman, Mountain Brook, AL | How Will We Live Tomorrow? Randy’s had a variety of careers – banking, employee leasing, financial planning, and commercial insurance. Currently, he represents a national firm that provides energy and preservation tax credit and depreciation guidance for commercial properties. I don’t know where he finds time to work given the number of books he recommended to me. Fortunately, Cleo reminded him I travel light. So, he started quoting his favorites directly. 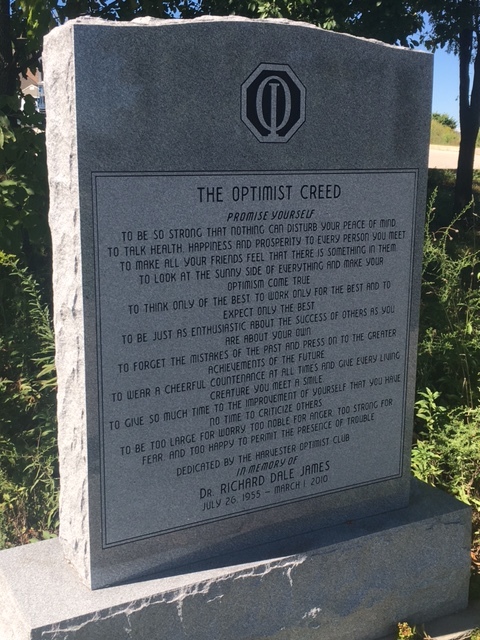 I had never heard the Optimist Creed. When he quoted it, I decided it describes Randy perfectly. This entry was posted in Responses and tagged A Man in the Mirror, Bob Buford, Half Time, Optimist Creed, Randy Gorman, SAE. Bookmark the permalink.